Are looking for something simple that will make you look elegant at the same time make you be noticeable in a crowd? The necklace is all you need to make you look smart and attractive. You no longer need to have bigger or too larger jewelry to make you look outstanding. The simplest thing that will make you appreciate the world of fashion is your necklace. Necklaces differ in prices and quality, there are those that are offered cheap and with poor quality and those that are sold at a cheaper price but offer good quality. The factors that you need to consider when getting any jewelry is the quality and the purchase price. You will good when you get a necklace of good quality at a relatively lower price. Your budget will determine it all if you will definitely get the best product or not. The metal stamp of this necklace is 14k. The metal itself is yellow gold in color. It has a width of 2.3 millimeters and length of 16 inches. The chain is known as the Figaro and is made of lobster- claw-clasps. The chain is not resizable. 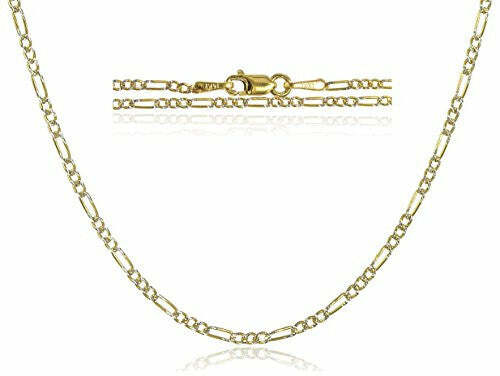 The approximate weight of the 14K Yellow Gold Pave Figaro Chain varies with the length of the chain, for the 16-inch length it weighs 1.84 g, 18inch weighs 2.06g and the 20 inch by length weighs 2.16g. The weights given above are for the chains who have the width of 1.5mm. For the widths of 3.2mm, the weights are as follows; 18 inches weighs 3.95g, 2 inches weighs 4.25 g, 22 inches weighs 4.7g and the 24 inches weighs 5.1 g.
What Makes the Pave Figaro Chain to be demanded? It is the features which make this chain to be required. Quality is the most popular attractant. You will just get amazed with the quality that the chain has. The chain cannot be compared to any other chain selling at its price range. This will make the chain to remain competitive in the market. The metal that is employed to make the chain is also of high quality and thus defines the quality of this item. The chain is not resizable and therefore it cannot be changed, its attractive condition will remain for as long as you want. Its rigidity makes it less easy to manipulate it. 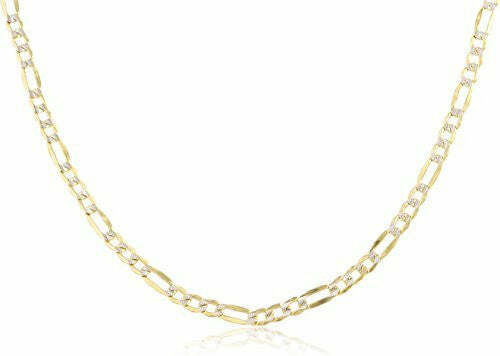 The necklace offers a wide variety of chain lengths that will make you make the suitable chain that you want. The diverse sizes ensure that the customer does not have to alter the chain in the struggle to make it fit his or her desired condition and size. It offers two widths that of 1.5mm and of 3.2 mm. The choice of the widths is very informed as it makes the Necklace to look just simple but elegant. You will not fail to like the necklace as it comes with so many attractive offers. The characteristics being the best, one will not be able to question the satisfaction that the product offers. You will be attracted to the satisfactory price that the necklace is charged. That only cost $103.99 to obtain a brand new Necklace that will serve you for as long as you wish. Besides the cheap price, the customer likes the discount that the product is offered at. At first, the necklace was charging $ 125 and now its price has been lowered. You will not have to worry about the extra charges for shipping or delivering your necklace. The offer of totally free delivery is available and it makes the necklace to be even cheaper. Besides the free delivery, there is also a free return of the product if fails to satisfy you. The availability of various payment methods makes it easy that you should pay the item regardless of your location. You need not worry because the item has been reviewed by one of the shoppers who did purchase the item and it is advised to be okay. This is the product to go for, it is anchored, high-quality product and affordable. The review that the item is fine is enough to make you trust the product and therefore you have time to make an order. The demand is also very high and the supply is very limited thus you require to make a fast decision ahead of the stock operates out. The offer of free delivery is also limited so you need to make your order as the offer is still available. You have to get this item for you to find the true quality that it offers. Confirmation is the best thing to do as there is an option of returning the product if does not please you.